I love seeing a project that is someone’s obvious passion, and this is certainly what I saw on a visit to Larch Cottage Nurseries in Melkinthorpe, near Penrith. 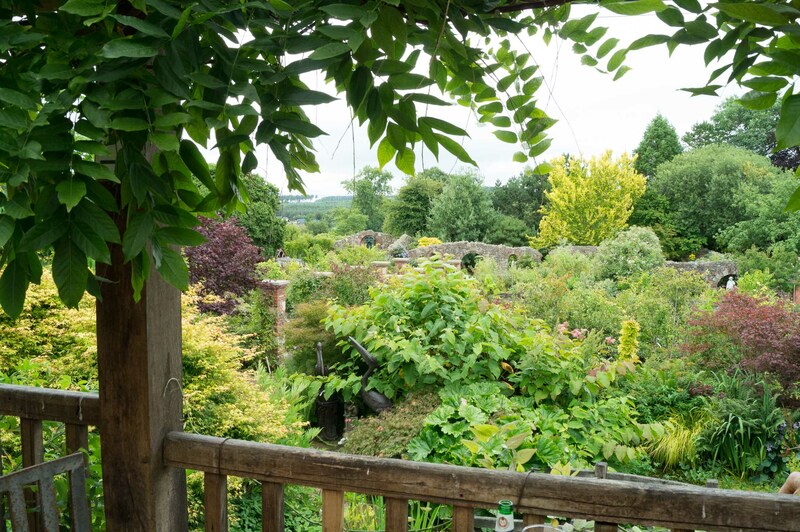 The nursery is a real hidden delight for gardeners and anyone else who just fancies a peaceful escape for an hour or two in a fascinating and characterful outdoor setting. Despite being told by others what to expect, I was still really surprised at what I found, and just how much there is to explore. I visited Larch Cottage on one of its open days for charity in August. The charity open days have been taking place on selected Sundays throughout much of the season, and continue into October – see the website for details. 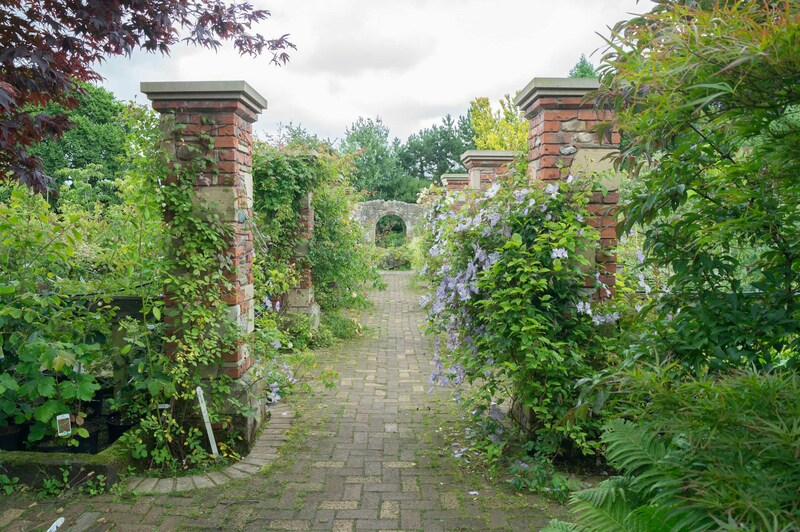 On these occasions, the owner, Peter Stott, opens the private gardens and chapel to the public, both of which are to be found at the rear of the nursery site. As a first time visitor, my initial impressions of Larch Cottage were already being formed as I approached the pretty stone front of the nursery, which sits on the side of a quaint but otherwise ordinary country road. The front is charming, but gives no clue as to what you’ll find on the other side of the buildings. 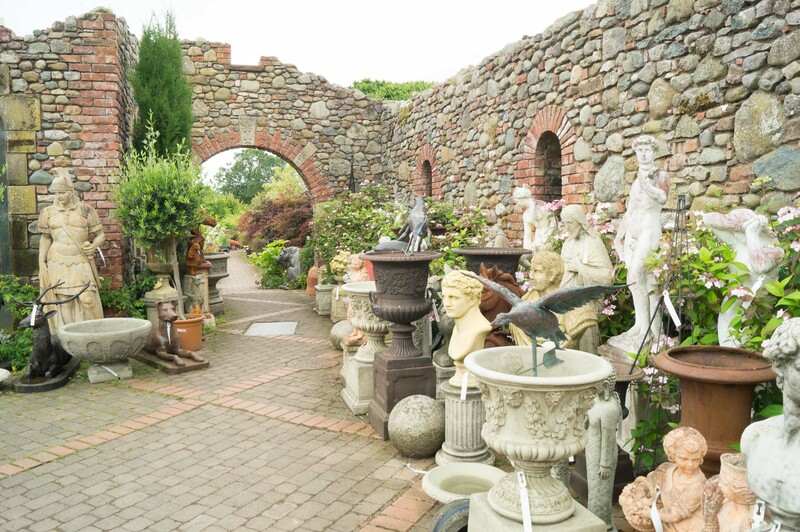 The nursery is a seemingly endless maze of interconnecting outdoor rooms, with every statue, bench and stone feature imaginable. I just love places like this where you can completely immerse yourself and forget what’s going on in the busy outside world, and the experience of walking through the ‘rooms’ seemed to go on forever. 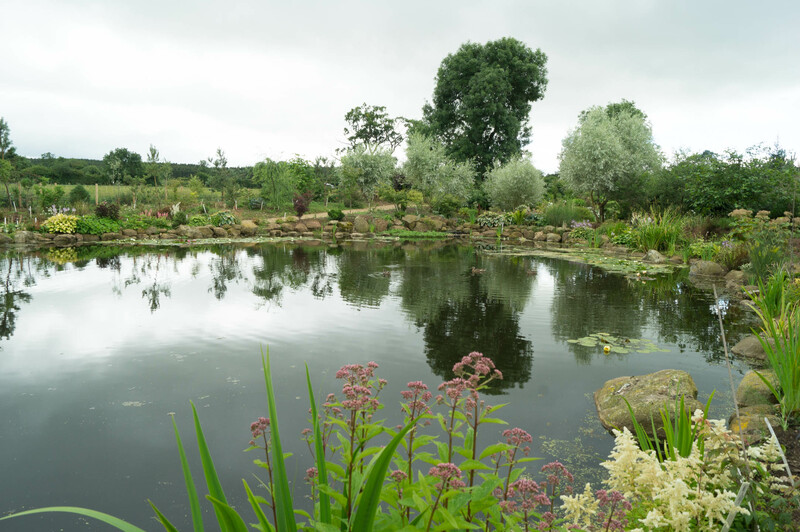 Finally our meandering journey took us through to the private gardens at the rear of the nursery, which are laid out around a central stream, and lead through to an open lake surrounded by planting. 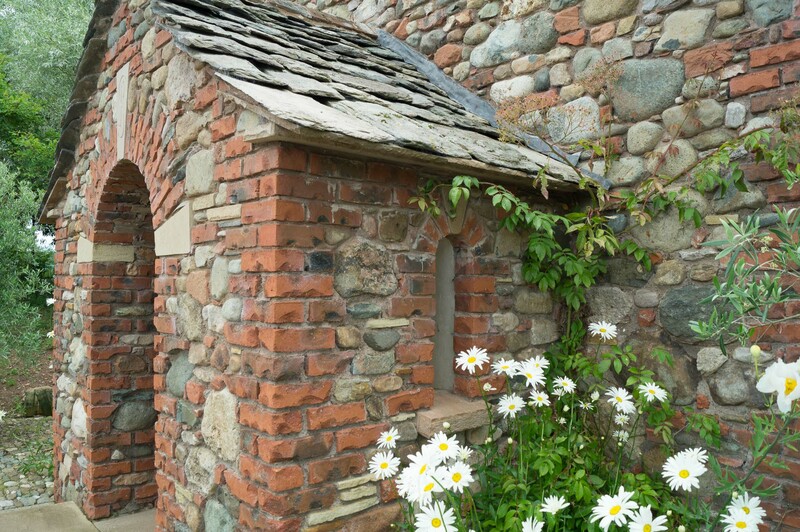 Behind the lake stands the most beautiful feature of all, Larch Cottage’s stone chapel. 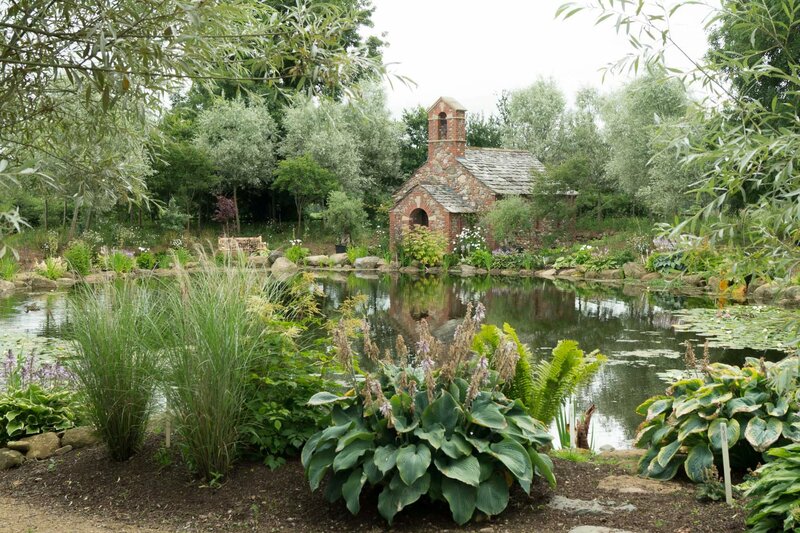 Peter began work on creating the chapel in 2009, which was to become the setting for his marriage to Joanne in 2014. Apparently the chapel is made using local stone and slate, and has the most intricate features both inside and out. 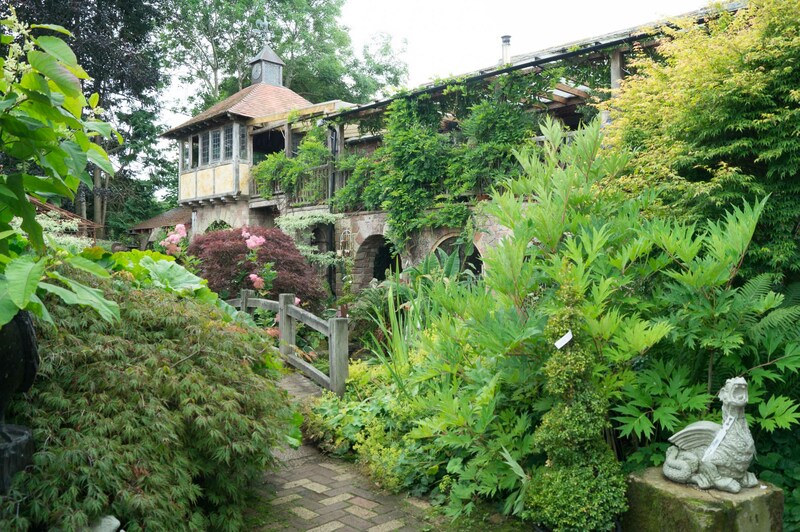 No visit to a garden nursery is truly complete without tea and cake of course, and Larch Cottage has a terraced restaurant called ‘La Casa Verde’, which serves an adventurous menu of lunches and light snacks – the choices are available to view online. I didn’t stop for refreshment this time (a sure sign I wasn’t feeling particularly well that afternoon! ), but did have a peek and took a sneaky picture from the terrace to share the view with you – I would love to have sat there for a while to take it all in from above, and so will have to make a return in the future. 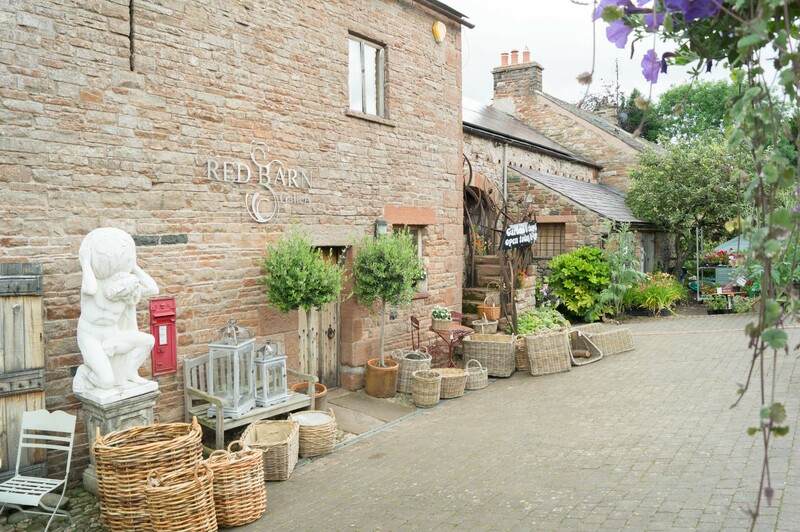 As if that wasn’t enough, on weaving your way back to the main courtyard area near the entrance, Larch Cottage is also host to a lovely gift shop called Red Barn Gallery – I’m not sure that the term ‘gift shop’ quite conveys the really good quality of its contents, so it’s definitely worthwhile stopping to take a look while you’re there. 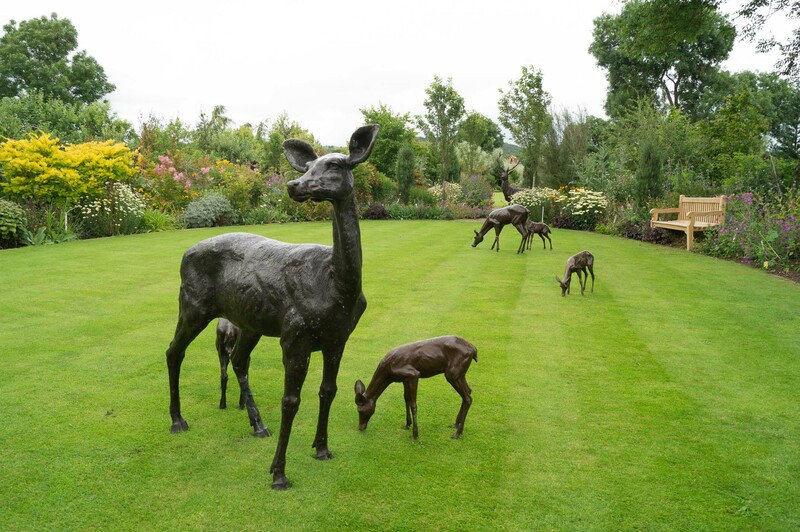 You can find out more about Larch Cottage Nurseries and its special open events for charity (opening of the lower lawns and chapel) online. 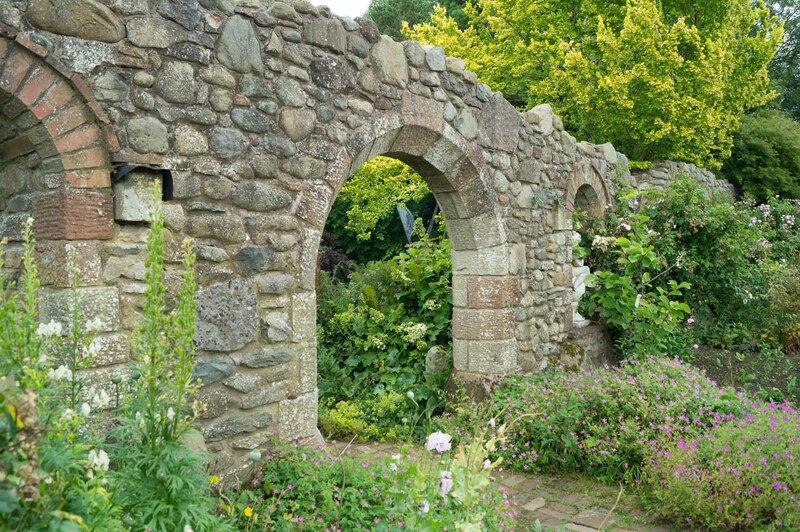 There are quite a few hidden garden nurseries around the Lake District. Have you visited Larch Cottage or have you any other recommendations you can make to readers on the blog? Please add your suggestions by leaving a comment below. I was there yesterday the 16th of January and it’s STILL wonderful despite there being ‘nothing’ to see ! In June it was simply breathtaking ! And what lovely coffee and cake and what nice people running it especially after the sheer anonymous NIGHTMARE of three days in Centerparcs ! Thank you very much for posting, David! It’s great to hear you had a good experience at Larch Cottage, even though it is the winter. It’s a fascinating place, and one I would like to return to at some stage as I have only been the once – perhaps in the spring when the alliums are said to make a lovely display there! I first visited Larch Cottage back in 2000/2001, finding it quite by chance. These were early days for Peter’s plans for the garden but one pure delight was the Japanese garden he had created. I fell in love with the beautiful granite lantern he had placed there and eventually persuaded him to part with it and he delivered it safely to my garden in Hexham, Northumberland. Despite moving home, it still has pride of place beneath a canopy of wisteria. I did promise to return the lantern one day and on my visit yesterday I was so happy to see that the Japanese garden is still thriving, so hopefully one day it will return to its rightful place in that peaceful corner of what has been turned into an amazing garden of delight. 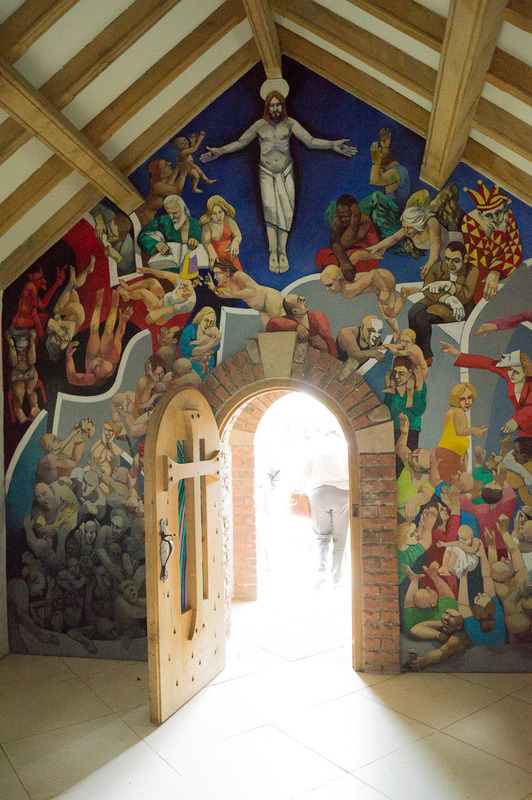 Yesterday was an Open Day, when visitors were allowed to enter Peter’s private garden and go into his final creation, the Chapel. What an amazing achievement for a young man who has made his dream come true and is prepared to share it with us all. Hopefully I will return to enjoy it more often. Thank you for your lovely comment Heather, and how fascinating to have seen the development of the nursery and gardens over so many years! I quite agree that it’s a very special place, and that the Open Days are really worthwhile visiting. It’s lovely to hear your story, and I hope you have chance to return again soon – I really should do so too!